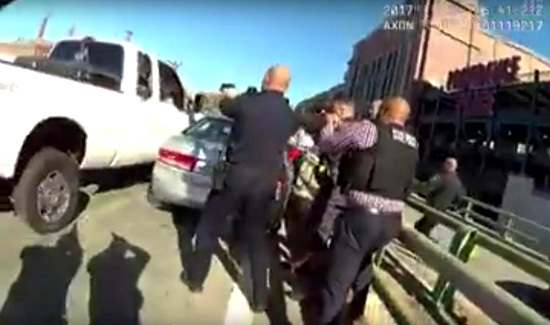 Rhode Island authorities on Friday released police body camera and traffic surveillance footage as they defended the actions of officers who, a day earlier, had shot and killed a pickup truck driver and wounded his passenger after a high speed chase. The incident began Thursday morning when a state trooper was transporting a handcuffed prisoner to court. The trooper stopped to investigate a car crash on Route 146 in Providence at approximately 9 a.m. ET. When the trooper got out of his marked cruiser, the prisoner took control of the vehicle and drove off without him, according to Rhode Island State Police. The stolen cruiser was found about 30 minutes later abandoned on a street in the capital city. State and local authorities launched an intensive manhunt for the escaped prisoner, identified as 35-year-old Donald Morgan. In the search for Morgan, authorities received a tip that the man was seen trying to get into a white pickup truck in the area, prompting investigating officers to pull over white pickup trucks in the city, according to Providence Police Chief Hugh T. Clements Jr.
At about 10:35 a.m., a white pickup truck sped off as a Cranston police officer attempted to pull over the vehicle, leading authorities on an intense pursuit. The Providence Police Department released video from Rhode Island’s Department of Transportation, which shows a large white pickup truck speeding up a highway, weaving through traffic and driving in a shoulder lane as police follow closely behind. The truck darts up a ramp onto Route 95, but a police officer had stopped his vehicle ahead to block traffic and prevent the truck from escaping. Numerous police cruisers pull up behind the truck and officers with guns drawn converge on the vehicle. But the truck tries to drive forward anyway, hitting a small car stopped on the ramp and ramming it aside. An officer helped the female driver out of that car, according to the Providence police chief. Officers jump out of the way as the truck smashes back and forth into vehicles, the driver apparently trying to force a way out. The Providence Police Department also released footage from an officer wearing a body camera who arrives on scene as authorities begin firing shots at the truck, which has tinted windows. Thick plumes of white smoke billow into the air from the truck’s spinning tires. More than 40 shots were fired by multiple officers and troopers in two separate volleys of gunfire, the police chief said. “We believe that video shows the acts of the officers as doing exactly what we would want them to do in stopping an imminent and significant threat,” Clements said Friday at a press conference to release the footage. The driver of the truck, identified as Joseph Santos, 32, was shot and killed. He was shot multiple times, according to the Providence police chief. A female passenger in the truck, identified as Christine Demers, was hospitalized for injuries, the police chief said. The man who stole the marked cruiser, whom authorities were initially searching for, was arrested Friday night at a residence in Cumberland, according to Rhode Island State Police. Morgan was charged with escape from custody, possession of a stolen motor vehicle, obstructing an officer in execution of duty, larceny of a motor vehicle, reckless driving and resisting arrest. Two other people, identified as Daniel Medeiros, 54, and Rachael Read, 47, both of Cumberland, were also arrested and charged with harboring a criminal, state police said. The Providence Police Department and Rhode Island State Police have launched a joint investigation overseen by the attorney general into Thursday’s officer-involved shooting, according to Providence Public Safety Commissioner Steven Pare. The case will be presented to a grand jury, which will determine whether the use of force was justified.